Arkansas Grown Magazine shares the stories of the people and businesses that make up Arkansas’ agriculture economy. Simmons is honored to be one of those featured in this annual publication. The story highlights Simmons as a homegrown Arkansas company with deep roots in Benton County and details the impact its new, modern facility will have on the region. You can view the publication at this link (starts on page 68) or read the full article below. Siloam Springs-based Simmons Foods is a third-generation, family-owned company that has called Arkansas home since 1949. A key ingredient in Simmons Foods’ homegrown recipe for growth has been a strong foundation of solid family values. “My father and grandfather built this company on strong family values like hard work and treating people right. Today we are proud of the fact that the majority of our 7,000 team members call Arkansas their home too,” said Todd Simmons, CEO of Simmons Foods, Inc. and Affiliates. Photo: Mark Simmons, Chairman of Simmons Foods (center) with his father Bill Simmons (left) and U.S. Secretary of Agriculture Orville Freeman at the Institute of American Poultry Industries Fact Finding Conference in Kansas City in 1963. On September 27, 2017, Governor Asa Hutchinson announced Simmons Prepared Foods was building a $300 million, 350,000 square foot poultry processing facility in Benton County on 870 acres between Decatur and Gentry off Highway 59. The site allows for both the future expansion and the creation of a campus-like environment for the benefit of the Simmons team members who will work at the new location. The production facility will incorporate the newest production technologies and ergonomically-designed work areas. Simmons Prepared Foods is nationally and internationally recognized for its unique ability to supply highly customized products to the foodservice industry. Pictured from left to right: Kevin Johnston, Mayor of Gentry; Bob Tharp, Mayor of Decatur; Todd Simmons, CEO and Vice Chairman, Simmons Foods; Mark Simmons, Chairman, Simmons Foods; and Judge Barry Moehring, Benton County. Benton County officials expect the new poultry processing facility, coupled with Simmons’ other operations in the area, will continue to bolster the economy in the region with more jobs. The additional jobs, payroll and tax dollars going into Benton County will help this region thrive for years to come. Payroll projections for the Benton County processing facility, based on current hourly wages and operating at full capacity in 2022, are projected to be more than $86 million annually, which will be infused into Benton County and surrounding area economies. The resulting demand for new and expanded service-oriented businesses, such as retail stores, grocery stores, and desirable commercial and residential development will help boost the local economy. Simmons estimates it will pay $2 million/year in water rates to the City of Gentry and an estimated $2.6 million/year in sewer rates to the City of Decatur. Simmons is proud to use local businesses and suppliers at every opportunity. Poultry farmers also have an opportunity to improve their businesses as Simmons plans to contract with existing and new grower partners to meet the demand for chickens for the new processing facility. 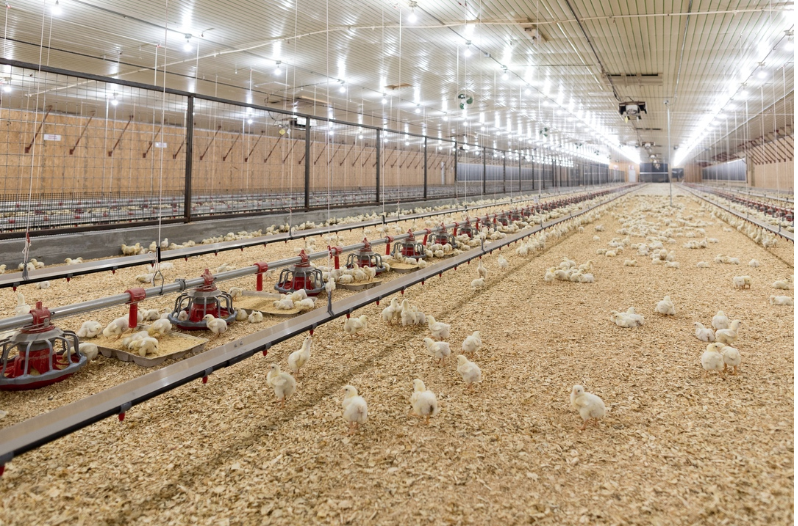 That means an estimated 218 additional chicken houses will be needed in Arkansas, Oklahoma and Missouri with more than 50 percent of these new houses expected to be on existing farms. 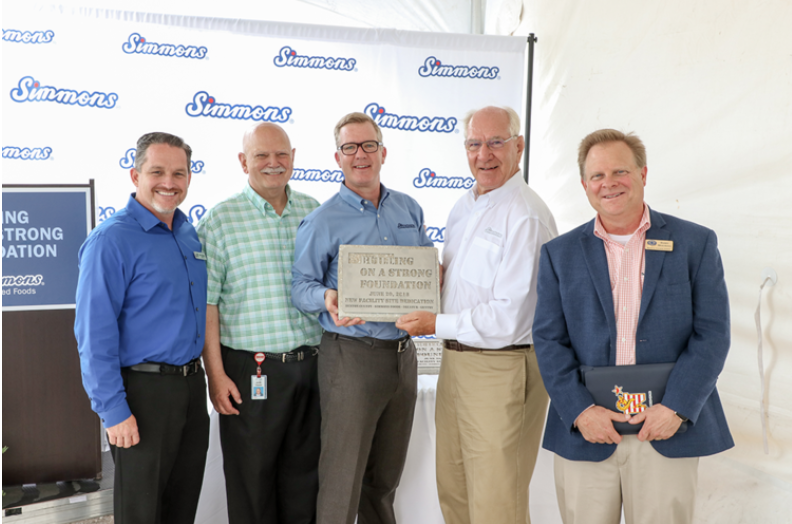 In addition to the new facility, Simmons’ already has existing operations in the Benton County area that include a feed mill, hatchery, propane distribution, business offices and a chicken processing facility, along with a dry pet food production facility operated by Simmons Pet Food. The facility, projected to begin operations in 2019, will create 1,500 new jobs, with total employment at the Benton County facility to be over 2,300 people by 2022. More than 50 percent of Simmons team members earn $16/hour or more (nearly double Arkansas’ current minimum wage). The Benton County facility is forecasting 164 salaried positions ranging from about $40k to more than $100k. Simmons’ offers starting hourly pay up to $16.45 an hour. A Simmons team member pauses for a photo at the company’s Siloam Springs further processing facility. Simmons opened a Hiring Center in Siloam Springs in late 2018. The Hiring Center, open from 7:00 a.m. to 7:00 p.m. Monday through Friday, is designed to make the application process faster and more convenient. Applicants will be able to complete their application, interviews and drug screenings in one place. The Hiring Center will process applications for 12 different Simmons facilities in the area. Interested applicants can apply online at WorkAtSimmons.com or by visiting Simmons Foods Hiring Center at The Shoppes at Siloam, 2998 Hwy 412 East, Ste 80, Siloam Springs, AR 72761— just across from the Walmart on Highway 412. Simmons Hiring Center in Siloam Springs, Arkansas, opened in November 2018. The design of Simmons’ Benton County processing facility has a substantially less intrusive exterior. The plant will look nothing like the production facilities of its kind in Northwest Arkansas—just one reason why Simmons says this isn’t your grandfather’s chicken plant. This new processing facility also represents numerous opportunities for Simmons to introduce new technologies to processes, equipment, energy use, safety, air quality, water management, water quality, and environmental stewardship. The facility will also have the latest technologies to ensure compliance with industry-accepted, science-based animal welfare standards. A Simmons Foods research farm manager provides an overview of a chicken house control room. Just northwest of the new processing facility in Benton County, Simmons recently invested in the development of a new research farm. Simmons will use this full-scale, completely operational poultry farm to conduct its own research and pilot innovative techniques for improving nutrition, equipment and technology, personnel training and housing enrichments. The farm employs cloud technology allowing certain data collected in control rooms to be accessed remotely. This research farm will enable nutritionists to test ingredients in diets first hand. The new facility will also feature advanced technology to pre-treat wastewater in accordance with all state and federal requirements. And, from an air-quality perspective, Simmons is introducing a fleet of specially designed, enclosed tanker trucks for hauling offal products.